Research shows that young American adults don't have adequate knowledge in personal finance, and need better guidance on managing their financial resources. Specifically, many of them would buy things out of impulse and regret those purchases afterwards. 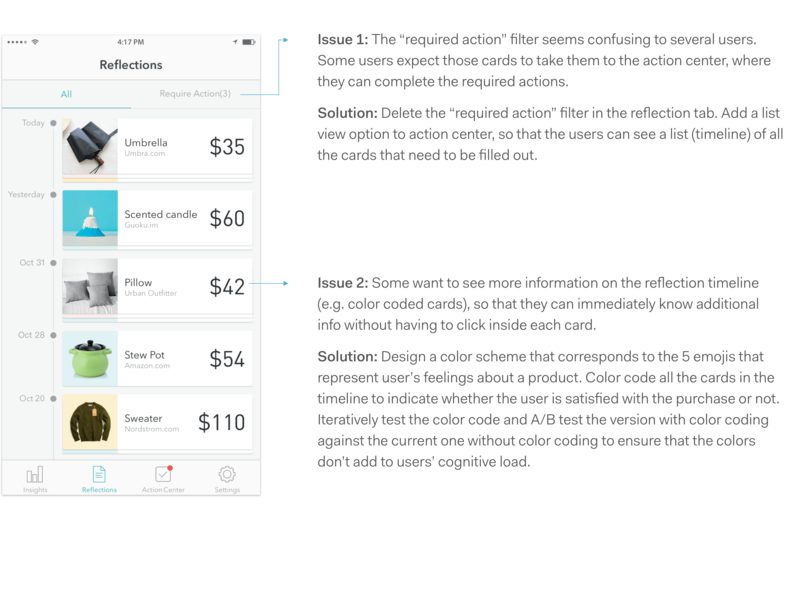 Mirror Mirror leverages AI algorithms to help emerging adults reflect on their past purchases and better understand the difference between the price of a product and its real value, one of the most important financial concepts one should understand based on our user research. 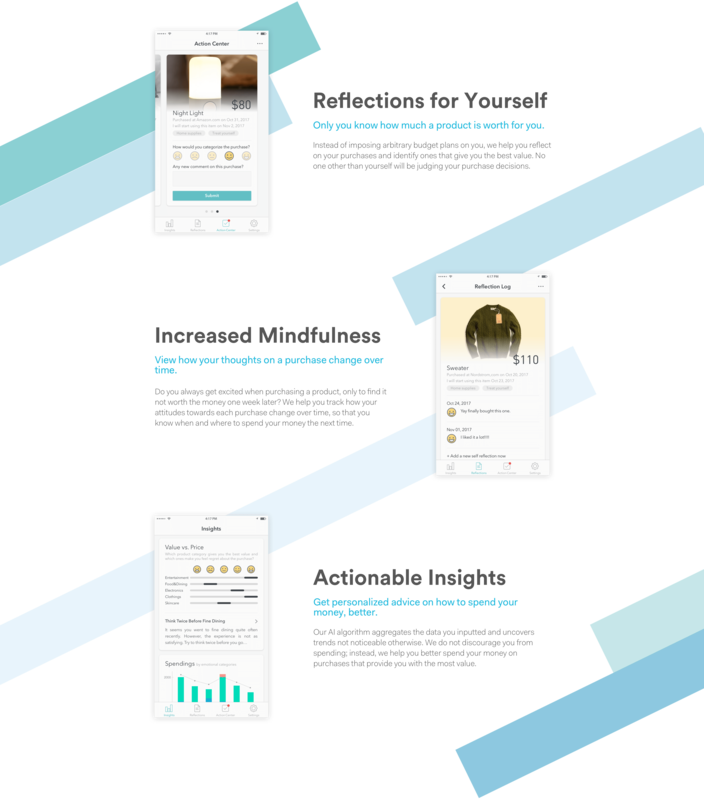 Our application encourages users to evaluate their purchase decisions, provides actionable and personalized insights based on users' own reflections, and helps users avoid making purchases that they might regret in the future. During the research phase, I conducted a literature review on personal finance education and semi-structured interviews with potential users and financial experts. During the ideation phase, three of my ideas were modified and developed into our four final concepts. I then advocated for collecting user feedback, which helped us narrow our ideas down. 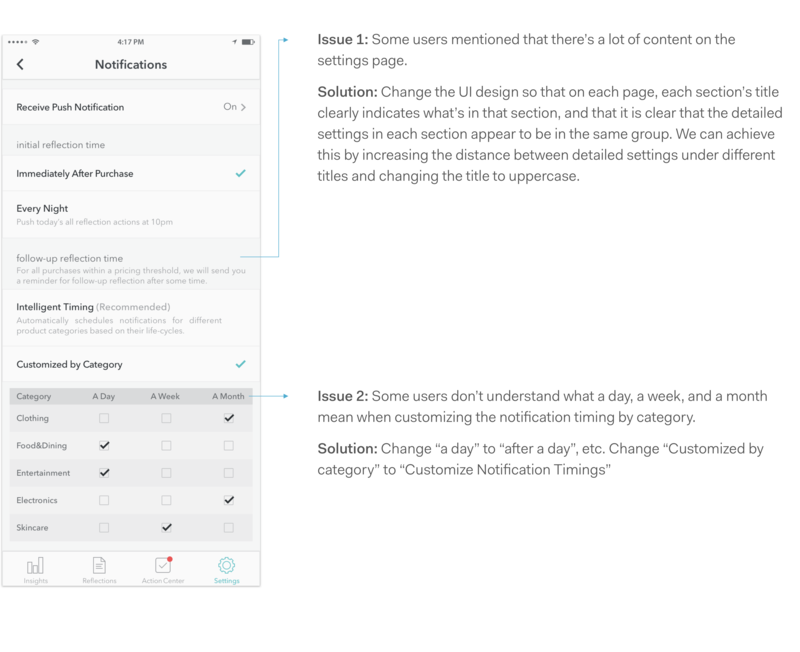 I contributed to the information architecture design, and was responsible for creating the wireframes for the settings tab. 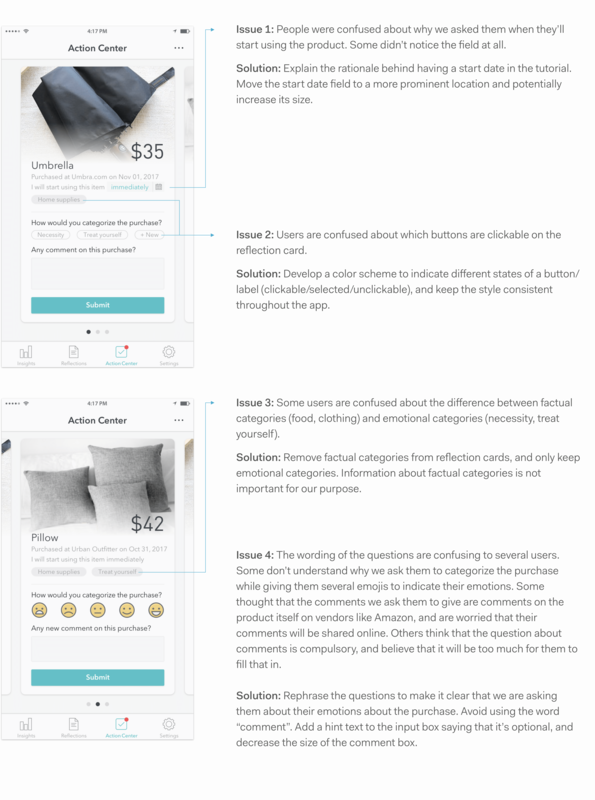 I then created the user-flow of the app and an interactive prototype using InVision. Finally, I moderated several usability testing sessions, and led the discussion of deriving design implications from the data with my teammates. We started the project having a vague idea that we hope to help young Americans learn more about personal finance. Initially, we hoped to help parents better educate their teenage children about personal finance. However, we pivoted based on our primary and secondary research, and focused on helping emerging adults aged between 18 and 25 form better financial habits. To better understand the problem space, we conducted a literature review and a competitive analysis. For the competitive analysis, we focused on financial education products for children and financial management products for the general population. American teenagers turn to their parents for advice when facing financial decision problems. Existing personal finance education apps are either too childish for teenagers or too static to raise teenagers' interests. Personal finance management apps focus on budgeting instead of spending wisely. Few products target late adolescents, who are not yet motivated to learn about complicated financial concepts, but will soon need them as they start working or enter college. 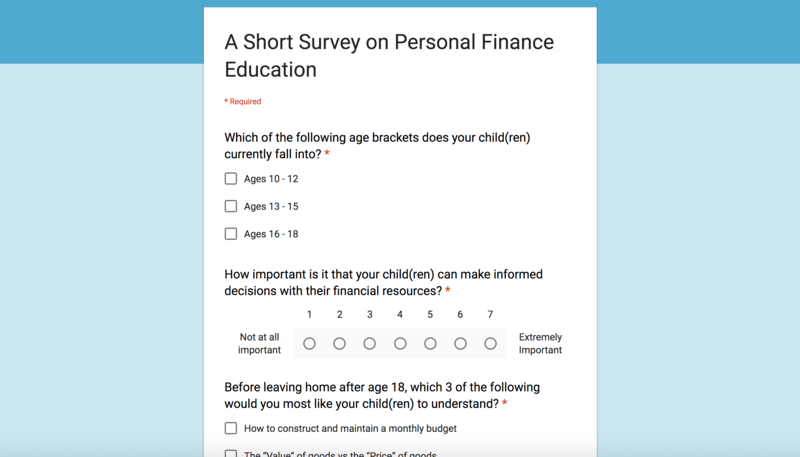 Focus on parents of teenage children in our following surveys and interviews to learn about their barriers when it comes to educating their children about personal finance. Use a survey to verify if we should narrow our target audience down to late adolescents and their parents. We first used a survey to 1) help us narrow down our target user group and 2) quickly learn about the most important financial concepts and the pain points parents encounter when educating their children about personal finance. We chose parents of teenage children as our target audience based on the results of our domain research. We then conducted semi-structured interviews with financial experts and parents of teenage children to 1) gain advice from experts and 2) dive deeper into the problems parents encounter when educating their children about personal finance. We created an affinity map as a group to identify themes from our qualitative interview data. Consistent with our domain research, we decided to focus on helping parents of late adolescents because children in their early adolescence cannot understand certain personal finance knowledge. It is also critical for late adolescents to learn that knowledge before they start to face real-world financial decisions. From our expert interviews, we also learned something unexpected--it was premature for us to assume that only teenagers need help with personal finance management. Emerging adults, those between 18 and 25 years old, also do not know how to manage their own financial resources. Therefore, we eventually focused our research on both parents of late adolecents, and emerging adults. Based on the survey & interview results, we realized that both late adolescents and emerging adults aged between 18 and 25 have the need to learn to better manage their financial resources. 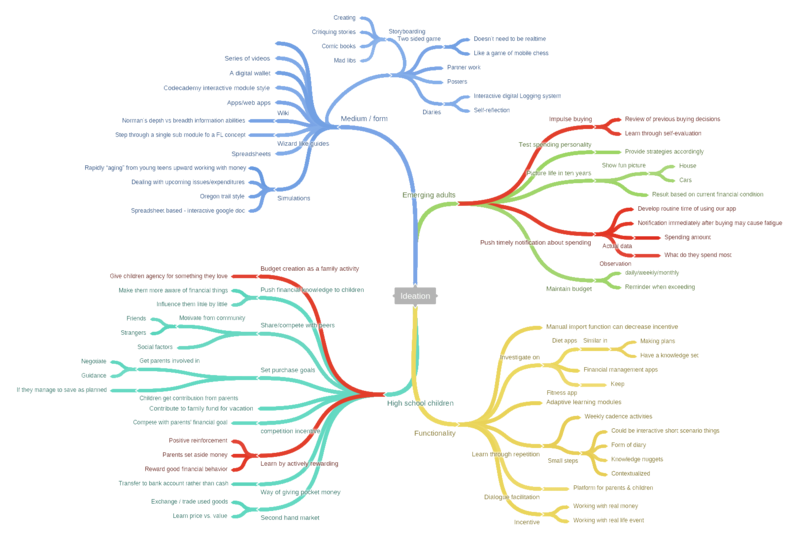 Since we cannot narrow down our user group based on our evidence, instead of arbitrarily deciding on a group to focus on, we delineated the different needs for pre-college teenagers and emerging adults, and brainstormed ideas for both. Budgeting, staying out of debt, and price vs. value (knowing the difference between the value and the price of something) are the top three concepts that parents want their children to learn before leaving home. Managing one's own financial resources seems to be a distant topic for late adolecents and emerginng adults, who lack interests in learning financial knowledge. Parents lack tools in educating their children about personal finance. Some parents consider themselves inadequate in financial literacy and thus cannot really educate their children effectively. Making a detailed budget plan and sticking to it (similar to a diet plan) is essential. However, most people, even adults, only have a vague idea about their financial own status. Impulse buying seems to be a major problem for emerging adults. Pre-college teenagers usually do not understand the importance of financial literacy when they are around their parents; once they enter college and start facing real-world financial decisions, they realize the importance of learning personal finance knowledge, but they no longer have enough chance/motivation to ask their parents about the topic. Based on the evidence we collected from user research, we conducted an informed brainstorming session. Each member first came up with a variety of ideas individually. The group then convened for several hours to share all the ideas and form a number of new ideas. We followed a roundtable “yes and” collaborative ideation process, in which we added on each other’s ideas to push them further for more details. We also voiced potential difficulties for the ideas on the list so that we can either further develop them and produce possible solutions, or eliminate them because of their low feasibility. We then narrowed down our ideas by grouping similar ones into bigger themes. We also referred back to the main findings in our user research, to make sure that all the themes we identified can address at least one of the main concerns of our users. Eventually, we narrowed our ideas down to the following four large themes that address our users’ concerns from different perspectives. The first two concepts primarily address the need of emerging adults aged between 18 and 25, while the last two concepts target parents of late adolescents. We first quickly sketched out our four ideas on paper and discussed the main functionalities in each concept. 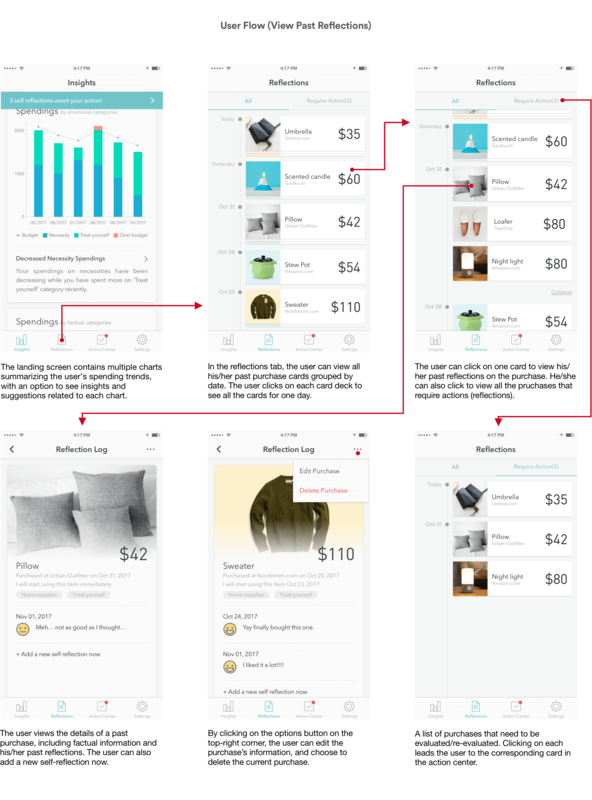 After that, we created a usage scenario for each concept, and drew out wireframes for crucial screens that represent the essence of our ideas. 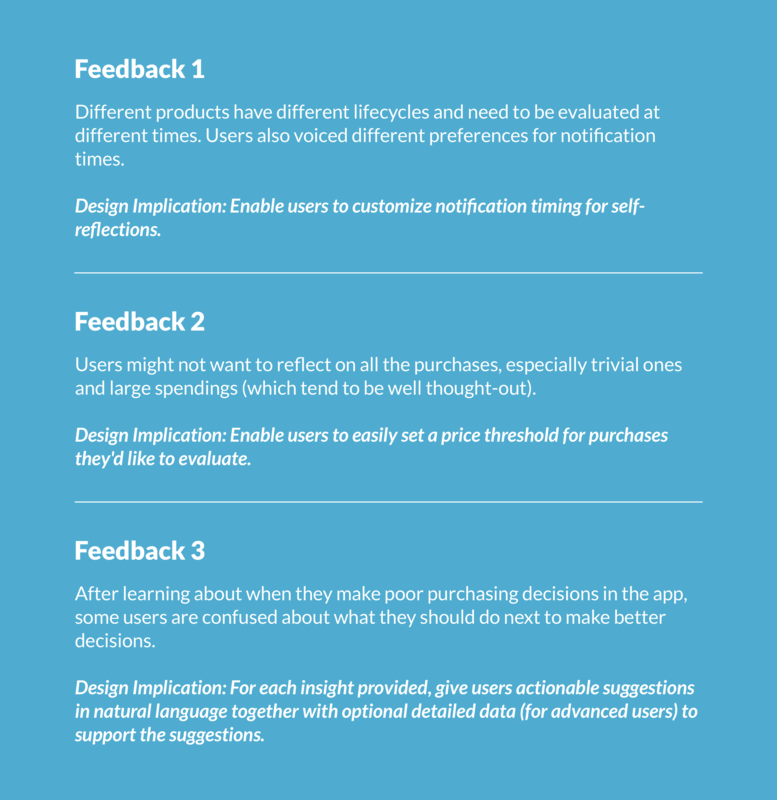 We then showed the following concepts and scenarios to potential users, and asked them about their preferences and their feedback on our designs. 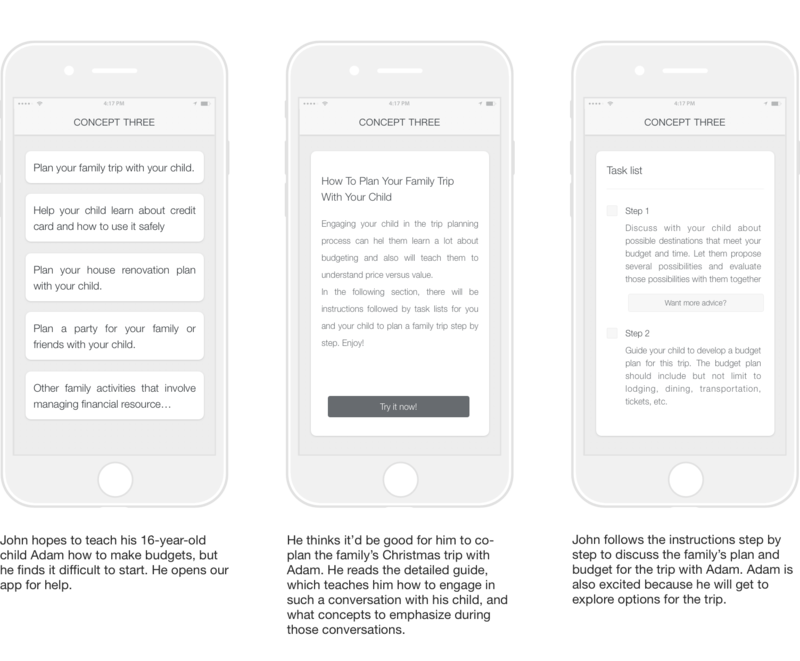 Our first concept leverages push notifications to encourage users (emerging adults) to provide feedback to themselves over time. With the user's own input, the system can generate personalized financial advice for the user. 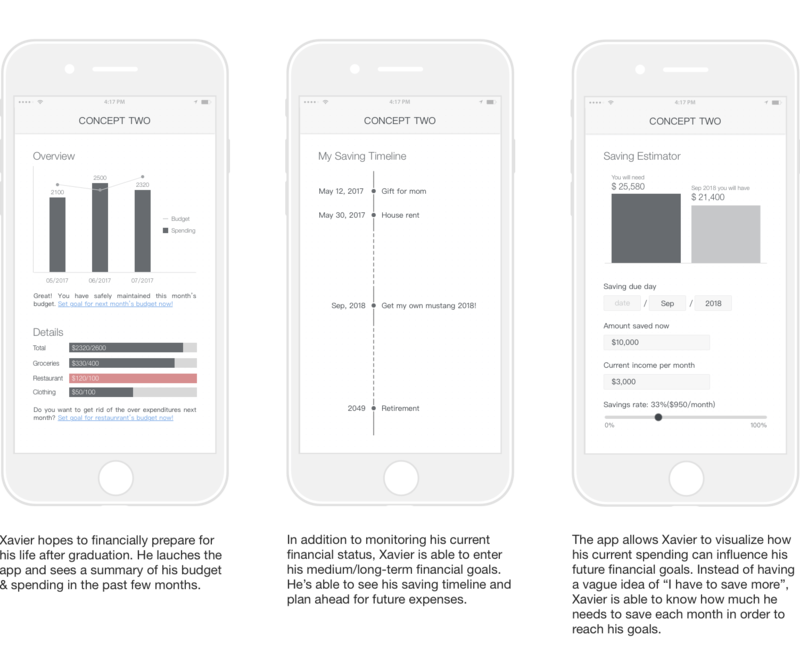 Concept 2 enables users (emerging adults) to set long-term financial goals, and clearly visualize how their current saving/spending behaviors can influence these goals. It brings distant financial concepts closer to users and provides actionable suggestions on what users can do now to achieve their goals in the future. Our third concept provides a comprehensive, step-by-step guide for parents to discuss financial matters with their children. It includes actionable steps parents can follow to involve their children in major financial decisions in the family. 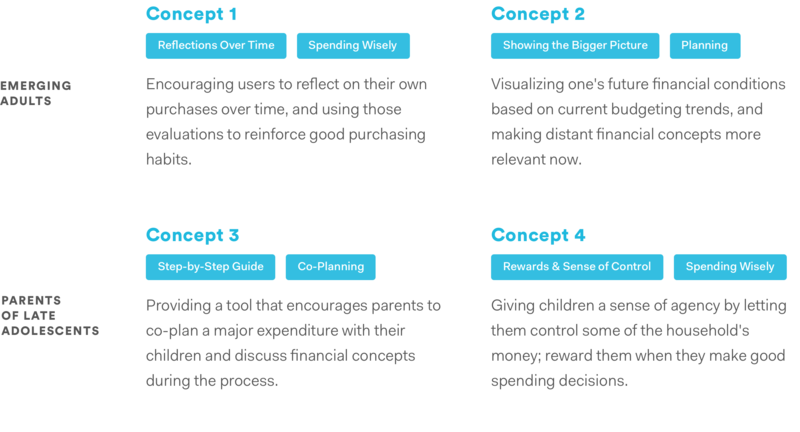 Concept 4 aims at giving children a sense of agency by giving them a portion of the family's budget and letting them make spending decisions under the guidance of their parents. Parents will provide rewards depending on how well their children spend the money. After gathering feedback from 15 users, we decided to proceed with Concept 1 as our core concept, and incorporate the short-term financial status analysis feature from Concept 2 into our final design. Most users preferred Concept 1 and Concept 2, which target emerging adults. For Concept 3 and Concept 4, participants believed that parents might not want to follow the instructions in the tool, and might want to carry out our supported tasks outside of our tool. Though the aim of these concepts is to provide a much-needed platform for parents to start conversations on personal finance with their children, most users cannot see it happening. Therefore, we decided to narrow our choices down to Concept 1 and Concept 2, and target emerging adults only. Several participants also pointed out that visualizing one's future financial conditions based on current saving/spending behaviors might not make sense for emerging adults. People between 18 and 25 are generally in the process of choosing a field of study or exploring career opportunities; it's usually unclear to them how their financial conditions might change depending on their careers changes. As a result, Concept 2 might not seem appealing to emerging adults. However, participants did mention that having a short-term financial status analysis feature (with no long-term goal setting) is beneficial. 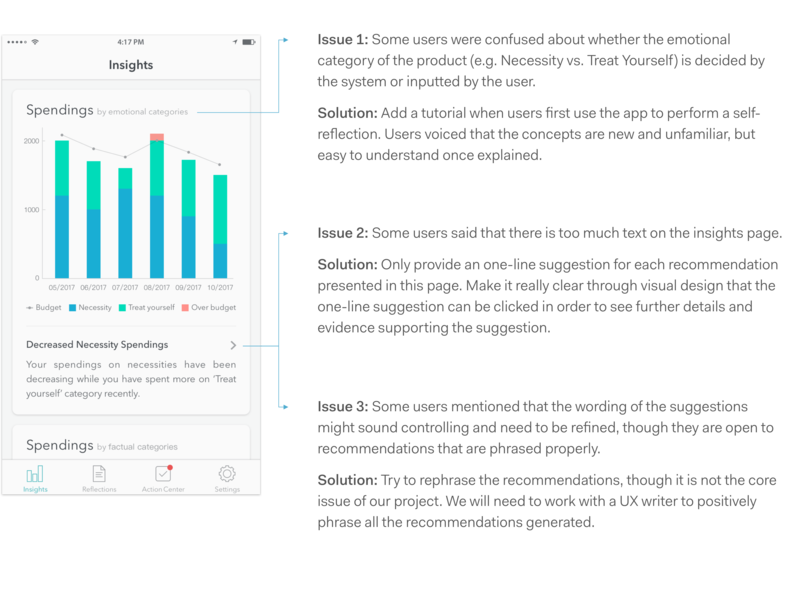 Therefore, we incorporated the short-term financial status analysis feature into our final design. 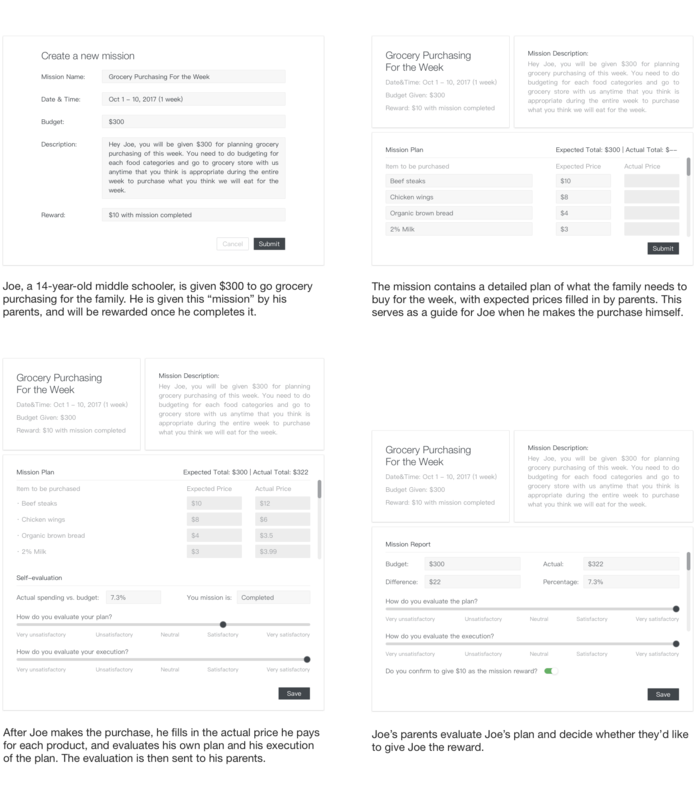 We created the following wireframes to make our ideas more concrete, and to make sure that the Information Architecture we derived make sense. The aims of our evaluation sessions are 1) to identify usability problems with our current design and 2) to assess the learnability of our application. 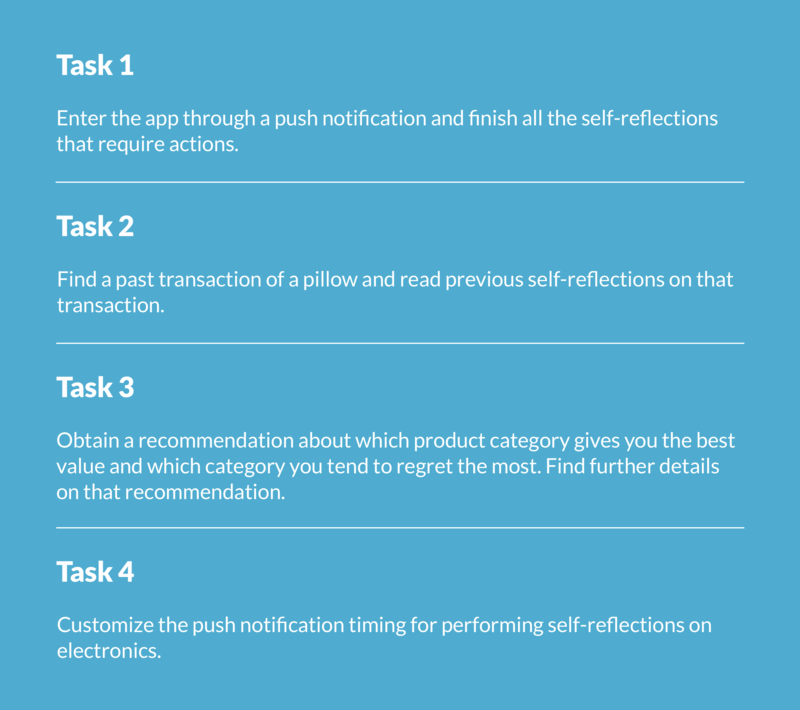 To evaluate the usability of the system, we developed the following 4 tasks that cover all the main features we have in our application. 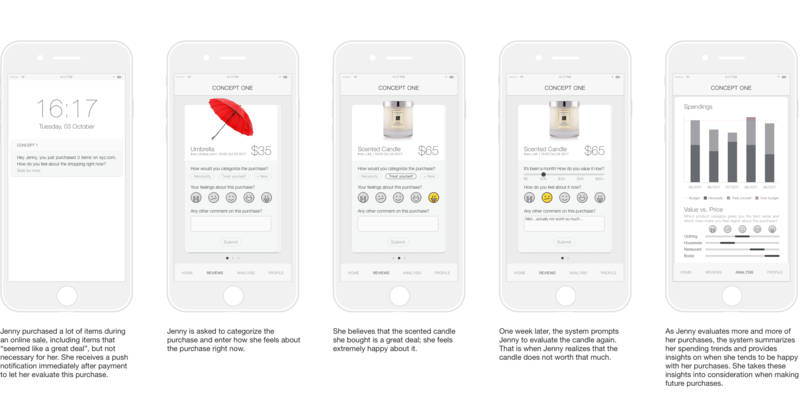 After providing a high-level description of our application's core functionalities and letting users freely explore it for 2 minutes, we let users accomplish the 4 tasks one at a time while thinking aloud. 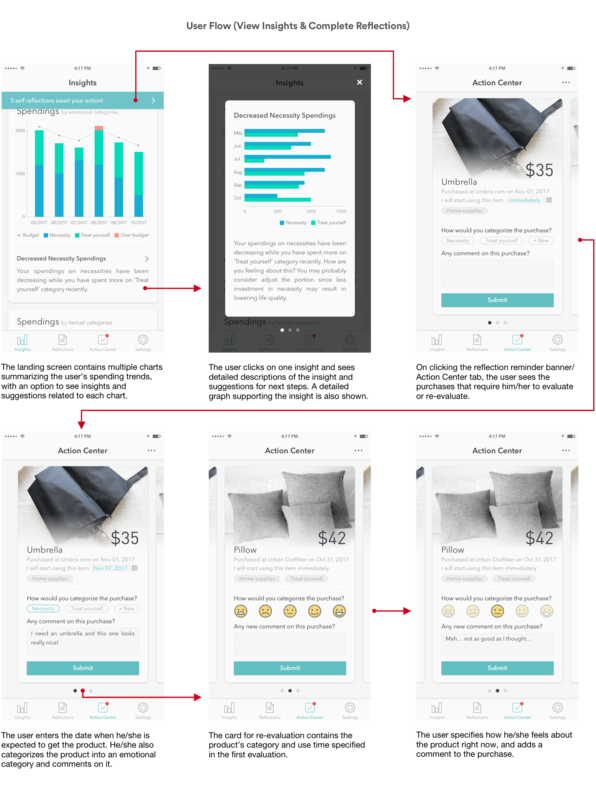 We then let our users fill out a questionnaire asking their demographic information, their purchasing habits, and their subjective ratings of the usability of the app (adapted from the System Usability Scale, or SUS). 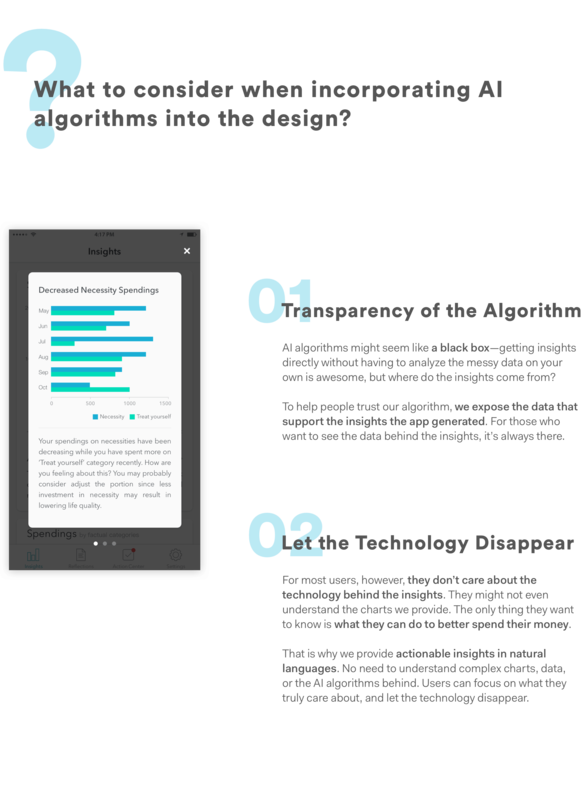 To measure the learnability of our app, we let our users accomplish the 4 tasks again after they fill out the questionnaire. 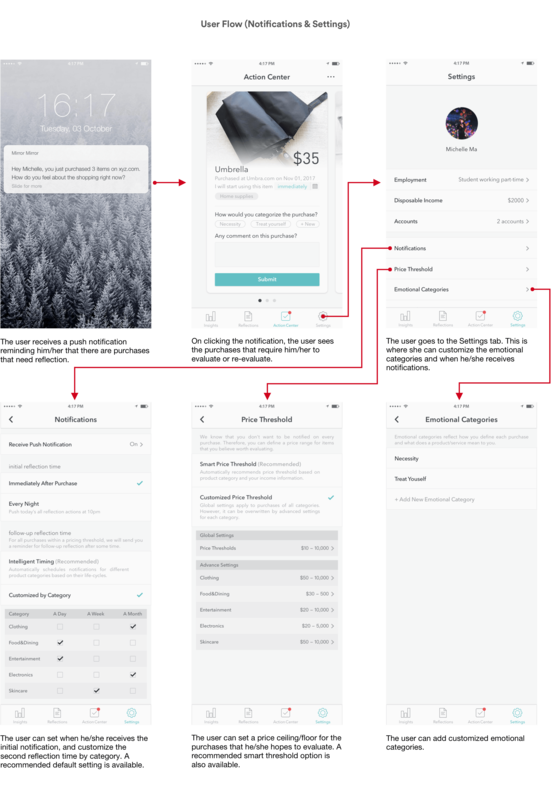 Since the problem we are tackling through our design is complex, and our app inevitably introduces new concepts to our users, we don't expect our users to understand them immediately. However, we believe that our users should easily understand the core functionalities of our app after their first use. Therefore, we asked users to compare their experiences completing the tasks in the two rounds of testing. Finally, we asked our users some general questions about their favorite and least favorite parts of the design, whether they understand the new concepts we brought in, etc. Users' subjective rating of the app indicated that even though the system is inherently complex, it is highly usable and learnable. 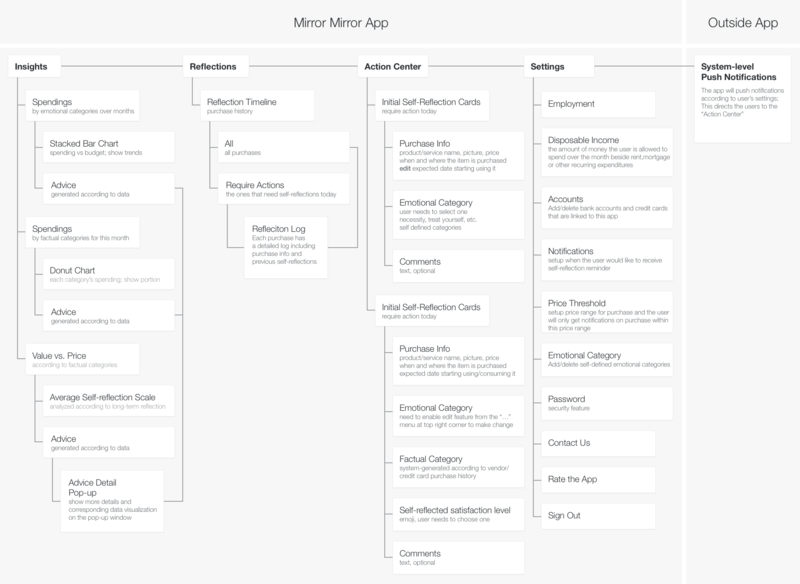 For issues raised by multiple users, we derived the following design directions, grouped by tab.